A couple of weeks ago, the Georgian Times published an article entitled "Demographic Information on the Abkhazian and South Ossetian Populations". The data seems to be based on government (Tsarist Russian and the USSR) censuses so we can assume the figures are correct apart from the author's typos, (and possibly mine) and any errors and changes in the way the censuses were conducted and nationalities classified. With those caveats, I have produced the following tables. The article was written in the old Soviet way, making lists of the figures so that no patterns are visible. At first I could understand that Georgians were miffed when Abkhazia broke away as I had always thought that a lot of Georgians lived there. Then after reading a bit more and finding that Abkhazia had been an autonomous region of Georgia under the USSR, I could understand perhaps that they wanted to continue with some form of self-rule. Independence is catching, even if it isn't always economically viable. Look at the debates about whether Scotland could afford to be independent from England. The general feeling is that they missed the boat and should have declared independence when gas and oil were discovered in the North Sea. Now it is nearly all gone, they are a bit late, even though they can get lots of money from the EU. No figures provided for Georgians to compare with that. *calculated from the total minus the rest. ** total of the above, no total provided in the article. Leaving aside the big differences in the two sets of figures for 1865 and 1866 and possible dispersal of Abkhazians in Turkey, the result seems pretty clear that most of the population of Abkhazia has been Georgian for a considerable time. Of course Abkhazians may have not bothered to classify themselves as such in the USSR, Georgian being good enough at the time. But from those figures (admittedly produced by Georgians) it's pretty clear why Georgians lay claim to Abkhazia. Also it's clear why there were so many IDPs from Abkhazia, and why they were still not absorbed into Georgia proper, if the government didn't do much to help. In 1989, South Ossetia, which only had the status of oblast' in Georgia, demanded unification with North Ossetia. In December 1990, the Georgian parliament declared South Ossetia no longer autonomous (sic), and began suppression of newspapers and bans on demonstrations. During the resulting fighting, according to the article more than 100,000 Ossetians fled from Georgia and South Ossetia to North Ossetia. The article says 10,268 of the South Ossetians now reside in Tbilisi. Which then raises the question of how many south Ossetians lived in Georgia and how many actually in South Ossetia during these years? And again, how many have reclassified themselves? That leaves around 28,000 recently in South Ossetia who have either fled north or south again, or stayed in their villages. Claims of genocide have generally died down on both sides. Of course nationality can be rather subjective question. In Istria, a peninsula containing Slovenes, Croats and Italians, people have responded to the nationality question in various ways over the decades. Many say they are Istrian first and anything else second. When fascist Italy took over Istria, it might have been politic to say Italian, and when the Yugoslav partisans came back, then Yugoslav was perhaps more useful. These days, when Croatia is not quite in the EU, European might be the best answer. You can find it here on Amazon. The image here doesn't do justice to the artwork. You need to look at the original on Amazon to see the horror. 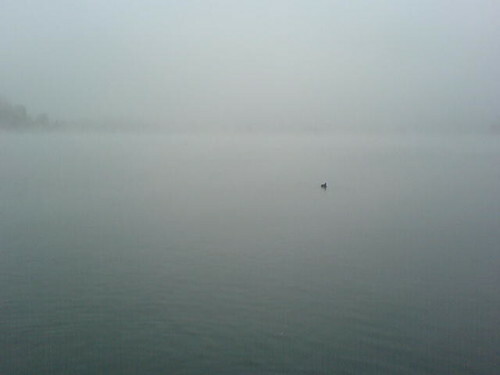 Here it just looks like an abstract painting. I'm not very good at reviewing books that make a strong impression on me. I start the review, often half way through the book, struggling to express my strong feelings. Then I finish the book, but not the review. I have half finished reviews for Imagined Communities by Benedict Anderson, and Imagining the Balkans by Maria Todorova. In the same vein I am in the middle of reading History in Exile by Pamela Ballinger. They are all by social anthropologists writing about history, memory and identity. I think if I had my time again this is a field I would have liked to have gone into. I find this sort of history, where real people struggle to explain what they experienced, in the light of what historians tell them was "really" happening at the time, absolutely fascinating. As well as the language they use to describe it, often with religious symbolism even for communists. which I knew nothing about, except my sister's hints of dark deeds after the war. Have you heard of the foibe (underground caverns with spiky stalactites into which fascists and others were thrown by partisans) or the Nazi concentration camp in Trieste which finished off Italian Jews and anti fascists alike? apart from some novels about the Greek exodus from Turkey in the 20s, and Russian Jews leaving for Israel and their recollections of the Soviet Union. Why do some not assimilate but cling to their exile status? Why did Italy "submerge" the history of the exiles like the people "submerged" in the foibe? Why do they feel like exiles in their own country? How long do refugees stay in camps and how do they feel about their life there? and how the complex memory is constructed first in the redemption from the Austrians after the First World War, then reconstructed during and after the Second World War (who was Fascist and who anti-fascist) and finally (perhaps) in the 90s, with ethnic cleansing in other parts of the Balkans, was history rewritten (or "unsubmerged") from political lines into nationalist Italian v Slovene/Croatian lines). Old myths of the good Italian and the savage Balkan are revived, which have nothing to do with today's reality in 2007 in the EU, but seemed more relevant in the 90s. And finally I understand what irredentism is. Maybe I will be able to write something more when I finish the book. I wonder whether anyone will ever do similar studies for the upheavals of Stalin's Russia, eg the Crimean Tartars, before everyone who experienced them is dead. And what about the people of the Austro-Hungarian border with Ukraine, where similar border changes have occurred. How do they decide who they are, and what sort of memories do they have? How do they keep their nationality intact? And what are their memories of the World Wars when during the fighting borders moved backwards and forwards? Who are the goodies and the baddies? Has glasnost and the breakup of the Soviet Union allowed a hidden story (ies) to emerge? The cheese sandwich and tiny plastic mouthful of water were not very special, but lunchbox philosophy is a new idea for airlines. Perhaps now there will be a haiku competition. Courtesy of the Adria Airways flight from Sarajevo to Ljubljana. In Lithuania the coming of Spring is signalled by the great St Casimir's Fair at the end of February when there is a huge craft fair, amongst other things selling verbas. These are arrangements of dried flowers on sticks, which range in height from a few inches to a full 2 metres. These days they range in colour from natural looking to distinctly artificial. It's the custom to take them to church on Palm Sunday (the Sunday before Easter) to be blessed, and then they retain the blessing in the home all year. I haven't heard about this happening anywhere else so I was quite surprised when my sister arrived home with something similar and said that also in Slovenia people took them to church on Palm Sunday. I didn't manage to see any myself but there is a video here of them being sold in a market in Ljubljana. Here they are just called Palm Sunday bundles. After lunch today (in the Turkish restaurant for a change) we went for a walk by the castle. Coming down the hill we met a church procession at the bottom of the hill. We stopped to watch. We tried to work out what it could be. The only customs I could remember from England were well dressing (no well in site) or beating the bounds (wrong time of year). So after a hymn and a couple of prayers in Slovene neither of us were any the wiser. Then the procession walked up the hill led by the boy carrying the cross followed by two priests. One had something in his hand which he appeared to be waving. Thinking this must have some religious significance I looked more closely. 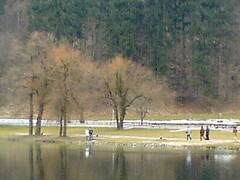 However, it seemed it was merely a text message which he was replying to on his mobile phone as he walked along. Did he really have God's mobile phone number? Or was he telling his wife to get the lunch ready? 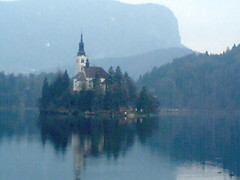 I found this post about stamps through Technorati tagged Slovenia. They were issued on the 23rd of September 2005 in a series about Gothic Art. The stamps, printed se-tenant, picture a detail of the Dance of Death fresco from the church of the Holy Trinity located in Hrastovlje. This fresco, realised by Janez of Kastav was completed in 1490. It is 90cm high and 630cm long. It features eleven figures representing various steps in life. They are all holding hands with a skeleton as pictured on the stamps. What is quite impressive on these stamps is something that can not be seen on the scan. The stamps are embossed on the skeleton : when you rub your finger on them you can fill (feel) the bones. Ever been irritated by the "English" translations on a menu abroad? My sister volunteered to make proper English translations for a friend's restaurant. So when she said "dandelions for lunch" we knew she meant it, and since the menu changes weekly, we knew that was special this week. 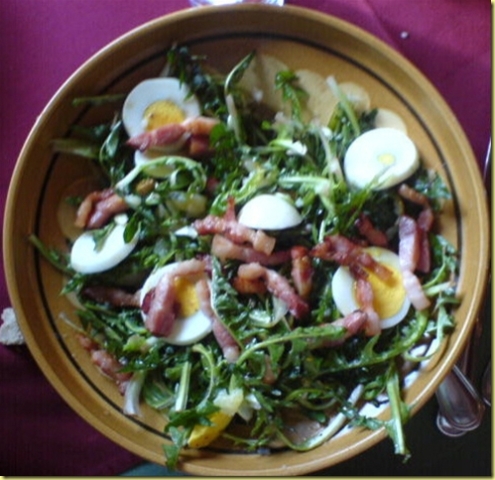 So off we went for a plate of Slovenian dandelions or Regrat s krompirjem, jajcem in peceno slanino. A bit like the French piss-en-lit au lard. You can read about that here. 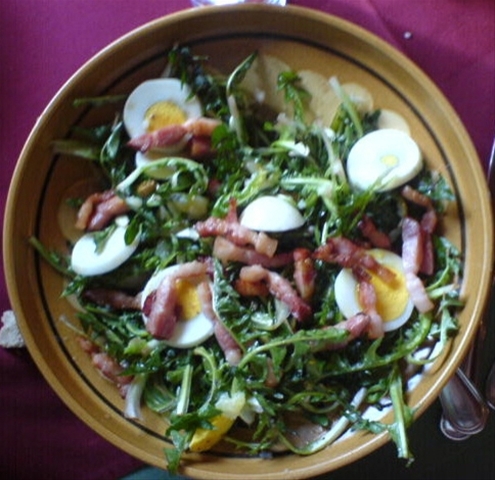 We got an enormous plate of dandelions, strips of bacon, slices of egg and potatoes with a little oil and vinegar. When I say enormous, the picture shows the amount after I had eaten half - it only then occurred to me to take a photo (on mobile phone). My sister complained there should be more potatoes. As the years in Athens made me a big fan of healthy green leaves (you can see my post about the varieties of Greek horta here, though I was never sure about having to boil the leaves), so I really enjoyed this. In Kosovo, I got used to having spinach leaves as fresh salad. Obviously you have to munch hard and eat a large quantity, but all of that is good for you. The restaurant itself, "Klub Preserne Zdravlice", is tucked away on Zupanciceva 9 and is only open for lunch, but was packed with office types. 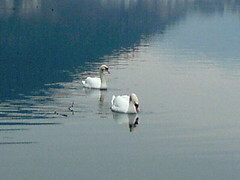 The couple who run it prefer a normal family life, and so the restaurant is closed in the evening and at the weekend. There is a terrace outside, (not in use yet this year), and the indoor seating has the feel of a pub. You can get a 3-course set lunch (soup meat and salad) for around 6 Euros, with a different set meal every day, and there is also a full menu to choose from. 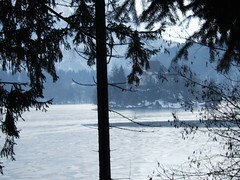 Bled has the same relationship to Ljubljana as Trakai to Vilnius: a trip from the capital is easy and hence obligatory for tourists and VIP visitors alike. They both have an island in the lake, and a castle but there the similarities end. 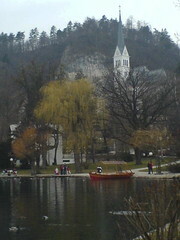 It's easy to walk round Bled in a couple of hours and there is a busy town catering for tourists and water sports. 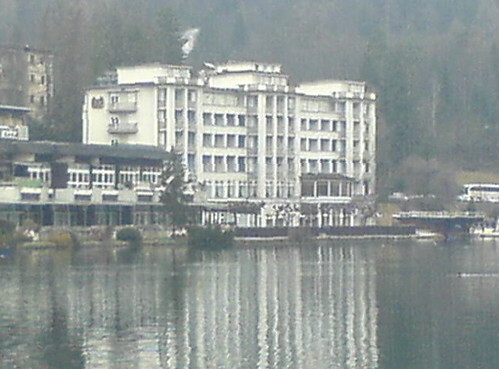 There are several hotels with restaurants overlooking the lake. 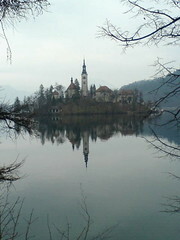 I've been to Bled three times now: in November 2005, when I didn't take many photos, and it was misty; in February last year when I was more successful, and I just made a visit this February as well. 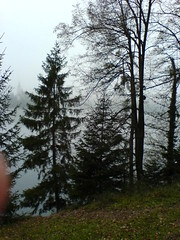 It is interesting to compare the seasons and the difference a year makes. Here are the November photos. 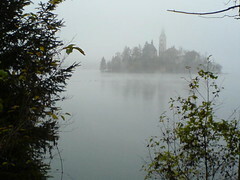 You can hardly see across the lake even as far as the church on the island. 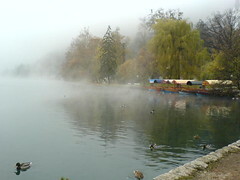 Nevertheless the ducks are out, and so are the boats. 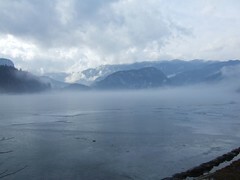 Here are some of the same views three months later in February last year. 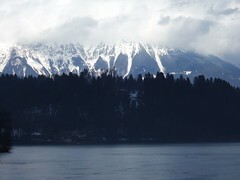 The lake is partly frozen but there are great views across the lake and including the mountains. Then compare with the February just gone. This time I shot both the church on the island and the castle on the hill and some of the buildings round the edge. And of course this year there was more wildlife visible. My collection of wild flower pictures will have to wait for another day. Did you know that Ljubljana is twinned with Tbilisi? No, neither did I. It seems Tbilisi is also twinned with Bristol, though I can't think what they have in common. Before I left the UK in 1997, I lived in Taunton. It was simple to recycle stuff. You took bottles, cans, paper and plastics to the local big supermarkets (which also recycled their plastic bags) and clothes, books, usable junk to the charity shops. Garden waste could be taken to the recycling centre and exchanged for bags of compost. I assumed everywhere else in the UK worked the same way. So it was a bit of a downgrade when we arrived in Lithuania. The arrangement for our flat was that we put the rubbish in a bag in a cupboard outside the front door and it magically disappeared within two days. Eventually we discovered we were paying the mentally handicapped "boy" downstairs a few litas for delivering it to the refuse truck which came at 3pm most afternoons, which we never saw, as we were never home. This arranged lapsed one day when we were having a party, when the "boy" came to the door with an axe and told us to be quiet. It disrupted the party a bit, but not a lot. Luckily the following week, rubbish skips were installed just down the road and we could take out our own rubbish, in a civilised fashion, whenever we wanted to. Eventually we found some places where bottles and paper could be recycled, eg in the international school car park. I forgot to check how far recycling has got in Lithuania recently, but the plastic bag problem is still solved by making you pay for every single one in the supermarkets. In Athens, recycling was non-existent when we arrived. This is what you would expect for a city with a horrendous landfill problem (I wrote about it here, I don't suppose it has improved) and a country with an EU Commissioner for the Environment! One of our pet hates was the supermarket bags, which were free, small and not very strong. This encouraged you to use hundreds with every shopping trip. Anyway, recycling started with little canvas bags for each household for your bottles and paper and cans, which you were supposed to put (all mixed up) into a separate skip from the usual one. 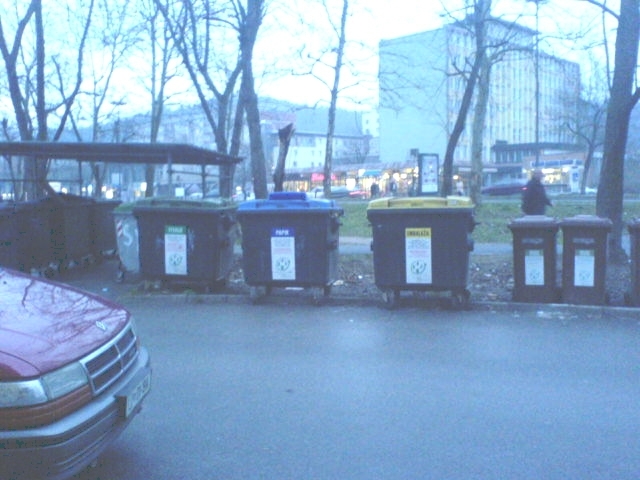 But as the usual ones were normally full, people just filled up the ones for recycling with ordinary refuse. Eventually our local supermarket got big containers for cans and paper and bottles, but these were usually full or blocked. I suppose this proved recycling worked. In both Lithuania and Greece, we found that when we moved, it was easy to recycle the stuff which would have gone to the charity shops. You just left it out by the skip and it was gone as soon as you turned your back. When we came back to Oxford, I found things appeared to have gone backwards. None of the big supermarkets in Oxford seem to recycle stuff. There are no skips for private houses, (probably because there is no common land to put them on). Refuse collectors come round once a week to empty our house bins. They won't take cardboard which has to be recycled. Bottles, paper, cardboard but not plastics have to be left in a green bin ready for the recycling truck, which is separate from the ordinary rubbish truck. More recently we were given green sacks into which we could put garden refuse and cardboard, but this had to be collected by a separate truck again. As if this arrangement was not complicated enough, we are now being issued with "green wheelie bins" and blue boxes (to complement the green boxes). Ordinary rubbish in the wheelie bins will be collected one week and recycling from the green box, the green sack and the blue box on the next week. New green wheelie bins have to be issued to each household because of the extra rubbish to be stored to compensate for collections being only every two weeks. In our household we find it hard enough to remember to put the rubbish out once a week, without having to remember which week is what, and which materials can be recycled in which box. The green one is for glass, the blue one for paper, the yellow one for all manner of plastic packaging. The small ones on the right are for so-called biological waste, stuff for composting. Everything else goes into the big skips on the left. Collection is available every day, so there is none of that confusion about which day the rubbish is collected. It must be cheaper to buy containers on this scale than for every house. Oh why can't the English learn to ............. be like the Slovenians. 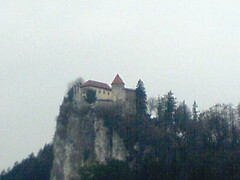 I'm busy adding to my list of Slovenian blogs, thanks to Technorati and Flickr. Thanks to Piran cafe for the photo and the link to gadling, a travellers' website.